Tweens Take Over Philly Type-IN! 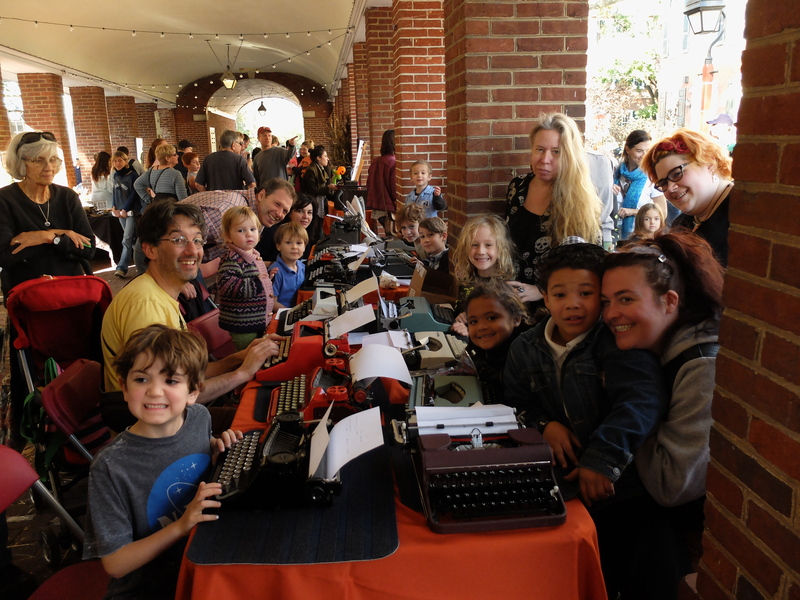 When you schedule a Type-IN and it turns out to be set right next to a big Pumpkin Fest for kids, you toss the program out the window and just keep loading paper into those machines and unsticking the occasional rugby scrum of type bars. These Tweens dug typing, and we went way over schedule. Michael Ardito of Hometown Business Machines helped with crowd control, brought a stack of his typewriters and gave out a lot of cards. He also answered some typewriter history and technology questions from the kids. Numerous parents had whispered Xmas present conversations, about which we can say no more, nudge, nudge, wink-wink! 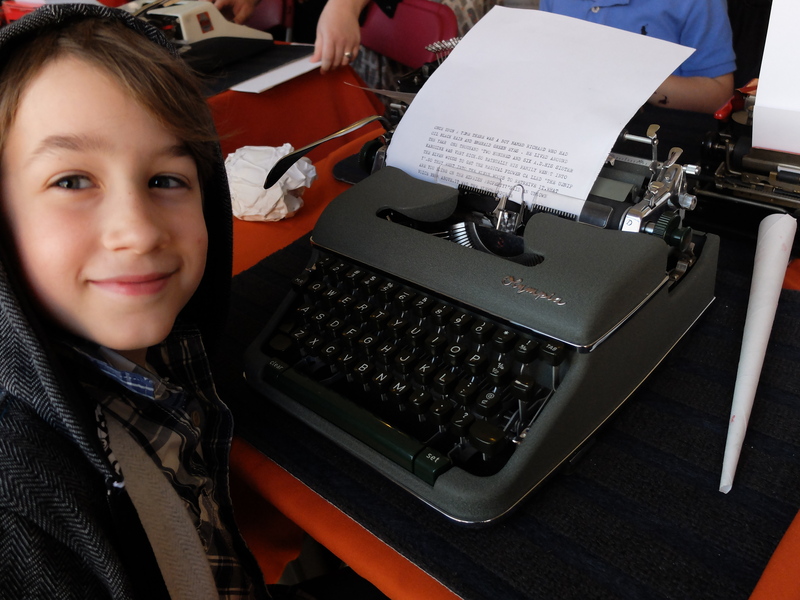 This young man comes from a typewriter-equipped home; he set to and immediately began a chapter story. This is about the fifth set of typers we had on the machines–and we had a blast. Thanks to one and all. Here’s a group pic of tomorrow’s typists! Greetings, Mr. Steven Huang, co-producer of this past Sunday’s Type-IN NYC, took time to make some good photographs from the event. Sat. December 8th. 1-5 p.m. Remember that cheery click-clickety-clack, -ding! ? That meant someone was tapping out a letter, or a term paper, or even a novel on a manual typewriter. 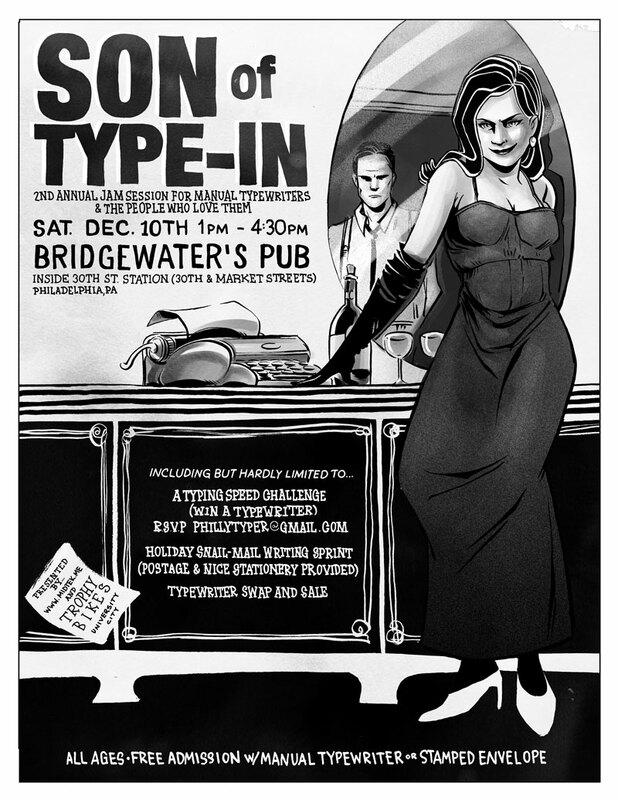 On Saturday, Dec. 8th, the sounds of analog writing return at the 3rd Annual Type-IN. Dust off* that old Remington, Olivetti or Smith-Corona; tote it to Fergie’s Pub in center city Philadelphia for this “Jam session for manual typewriters & the people who love them,” as organizer Michael McGettigan dubs it. 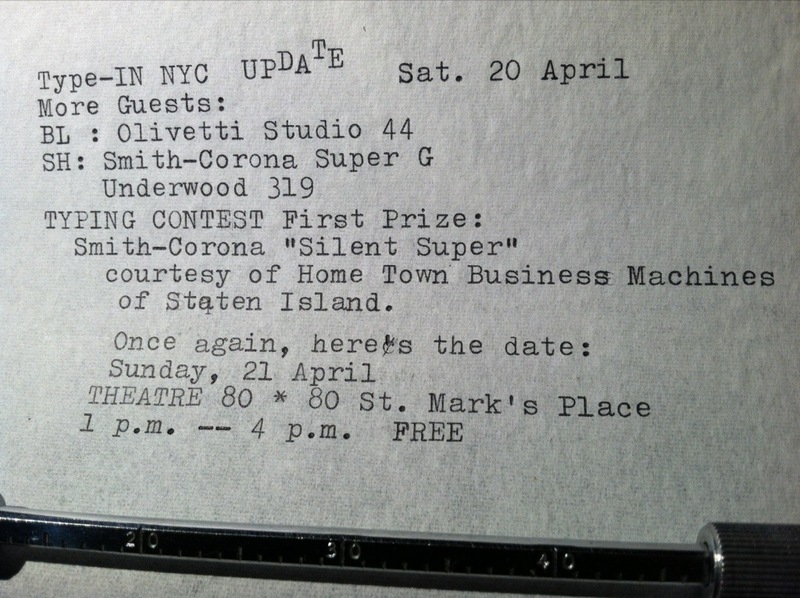 Back in 2010, McGettigan invited manual typewriter fans to Bridgewater’s (a classic Philly pub) to display their classic writing machines, take part in a speed typing challenge, bang out some letters and maybe even have a beer. That first Type-IN got national media attention; since then, dozens of Type-INs have popped up around the US, and more recently in Italy and Switzerland. 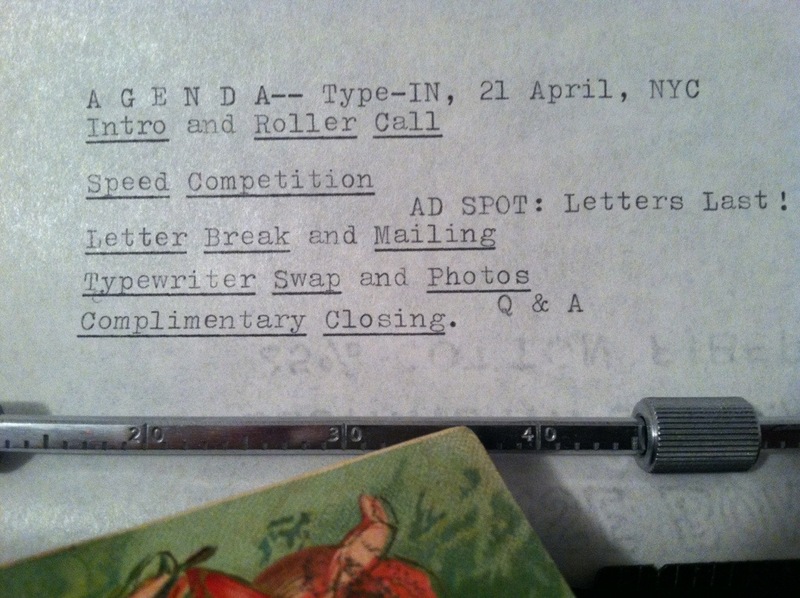 As in past Type-INs, there will be a speed typewriting competition “with chintzy prizes” McGettigan notes. Bring loved-ones’ addresses for a holiday letter-typing session (free stationery and postage provided). The event will wrap up with a typewriter swap–bring an extra machine (working only, no electrics, please)or two to trade. 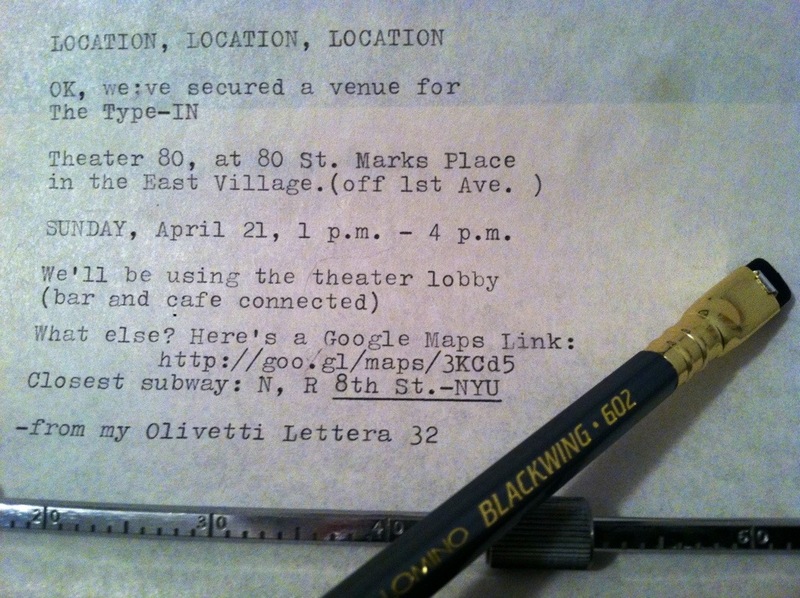 The event is free (with manual typewriter –or stamped envelope) and open to all ages. It’s ON! Son of Type-IN. Sat. 10 Dec. Philly. Same Place.